Get ready for the ultimate 80’s throwback. 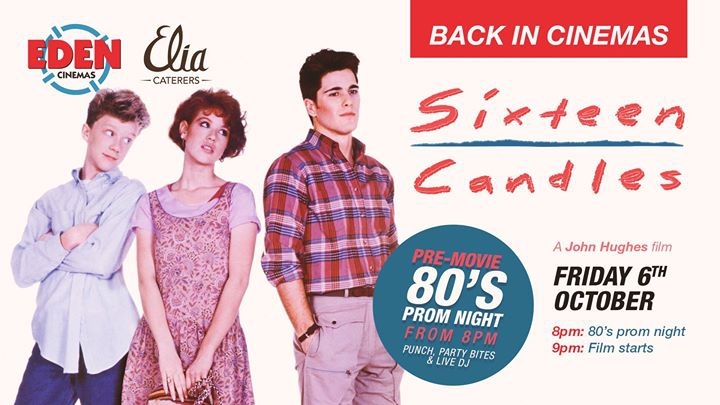 On Friday 6th October from 8pm, Eden Cinemas is transforming their foyer into an 80’s style prom night, before the screening of the 80s film classic, Sixteen Candles by John Hughes. Sip on some punch, nibble on some party food and boogie to 80’s disco music before watching the ultimate 80’s high school movie. Samantha Baker is approaching her sixteenth birthday, but sees little to celebrate about: her family have, in any case, forgotten her big day, and she is suffering from a severe bout of unrequited love. Worse still, the object of her affections is being courted by the school’s most desirable student - can Samantha trust her quarry to value brains over beauty? Tickets for the prom night and movie are just €7. This event is supported by Elia caterers.